As a blogger, one of the nicest things about owning a decent tablet is that I can sit and write whenever, and wherever the mood takes me. Tablets have a reputation for being devices of consumption, so can feel a bit limited when away from a decent internet connection, but all I need is a copy of iA Writer for iPad and I can easily while away a few happy hours working on my next post for dependentongadgets.com. I will admit though, that a touch-screen keyboard does come up rather short when it comes to longer writing sessions. It's not impossible by any means and useful for a spot of light editing, but it's less than ideal. The addition of a Bluetooth keyboard for me, makes for a much more complete gadget and I've worked my way through a few since starting my blog on WordPress back in 2010. There are a huge amount of Bluetooth keyboards available for iPad, each trying something a little different to stand out from the crowd. I currently have a Zagg Profolio+ which wraps the iPad in a protective case and sports a lovely keyboard with backlit keys. I also have Logitech's keyboard for iPad, which has its own case that doubles as a stand for the iPad. In the past I've reviewed the super-light Logitech ultra-thin keyboard and more recently the Brydge+ keyboard, which makes you feel like you own a mini MacBook Pro! The battle of the tablets centres around making devices that are powerful, but light enough to hold in one hand for sofa-surfing. Consumers clearly value lightness and portability, as the fastest growing sales are in smaller models. It's no surprise then that keyboards also try to disappear into covers and cases, but when you think about it, a 10" iPad with a decent keyboard is still an incredibly portable device! If you're a writer of any sort, a little more weight in the keyboard in order to deliver laptop quality typing would not be a huge compromise. The closest I got to PC quality typing on the iPad was with the Brydge+. It's a lovely aluminium keyboard that doesn't try to hide away and instead confidently makes the tablet feel like it's something else entirely. I found it hard to criticise in my review, but even for iPad keyboards, which often cost £80-£100 (I've also tried the £20 stuff to my regret) it may be too expensive for some. If you loved the sound of the Brydge+, but found it blows the budget, or you want the function but don't see the need to pay the extra for the form, then the entry-level 'Brydge' may be for you. Rather like the Apple iPhone 5C, the Brydge is 'unashamedly plastic'. Swapping the Brydge+'s aluminium shell for a quality polycarbonate and losing the '+' symbol puts the price back in line with other keyboards from the likes of Logitech and Belkin. So how does it perform? Well, having already raved about the Brydge+, I'm pleased to tell you that the typing experience here is right up there with the best. Having used it solidly for a few days now, including all day today, taking notes at a conference, none of the functionality has been lost compared to its big brother, just a bit of the shiny. The Brydge still makes the iPad feel like a little laptop and it improves on previous favourites like the Zagg by allowing you to set the screen at your preferred angle and easily remove it when you want your tablet to be a tablet again. One thing I would miss about the Zagg is the backlit keys. Something I hope Brydge will consider adding to future versions, even though it does have an impact on battery life. 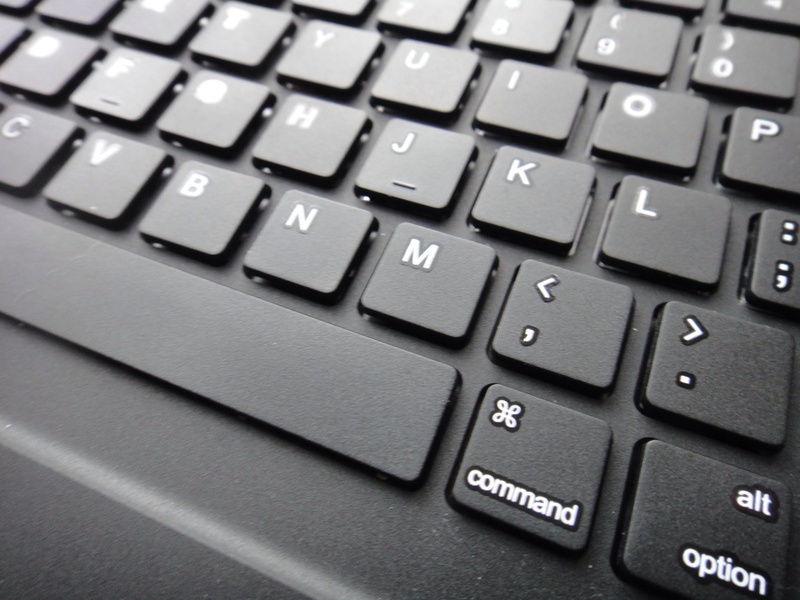 The command key allows for keyboard-shortcuts like cut, copy and paste. As with Brydge+, Brydge currently supports the iPad 2, 3 and 4 (didn't they just call that one 'new iPad' at the time??) with an iPad Air edition in the works. Anti-gravity fans will still likely choose the ultra-slim keyboards, but folks who are serious about using their iPads for more than just a FaceBook status update or a tweet should definitely consider a Brydge.